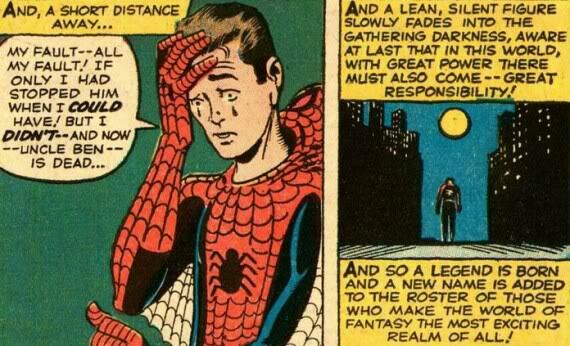 Later versions of Spidey’s origin revised the story. The story now is Uncle Ben would usually tell a young Peter Parker this lesson while he was alive and Peter Parker would remember this. These revisions also shorten the quote to the current version, which comes off as more poetic. Geek wisdom: A lot of people think that, once they have some form of power, they can usually laud it over people and abuse it. History has a lot of people showing them becoming corrupted because of great power: Napoleon and Hitler are just a couple to name a few. Even in a small scale, we do see powerful people beat down on the weaker ones. Bullies, abusive spouses, and corrupt politicians are just a few examples of the kinds of people we see every day that use their power the wrong way. “With great power comes great responsibility” has a simple meaning; if you have the ability to do something, make sure that you do it for the good of others. Highly admired people like Ghandi and Ninoy Aquino have done things that follow the spirit of this message. If you can stop something bad from happening, do it. You don’t have to be a superhero to follow those words of geek wisdom. It’s possible to do small actions that have a big impact in the world. It’s ‘lord’ it over people, not ‘laud’ which means praise, hardly what is meant here. Some spelling revision needed perhaps. Oh look out people we got a spelling nazi. Flora is right. Using language correctly is also a form of great responsibility.